The plant disease known as late blight of potato is infamous for its devastating effects on Ireland in the mid-19th century: Its catastrophic impact on potato crops led to the Great Famine, a period of widespread starvation and mass emigration of roughly 1 million Irish citizens. This clever pathogen, also known as Phytophthora infestans or “plant destroyer,” can spread like wildfire and evolve rapidly. When conditions are ripe it can wipe out a field in a matter of days. Late blight infects potatoes and tomatoes, often emerging as relatively small brown or pale green spots that quickly spread into dark, moist, oily patches in wet weather. These spots, or lesions, often turn white and fuzzy in appearance on leaves, stems and fruit as the pathogen produces thousands of spores. In 2009, late blight made its way to Wisconsin after a seven-year hiatus. Since then, it has been detected each year. To put the potential threat into perspective: Wisconsin ranks third in the U.S. in acreage of potato production, and Wisconsinites grow roughly 2,000 acres of tomatoes for fresh markets and in home gardens. The good news is that UW–Madison’s Plant Pathology Department, led by Professor Amanda Gevens, is making great strides in the understanding, awareness and management of this disease — and she’s helping Wisconsin farmers fight back. One of the main prevention tools Gevens’ lab offers to growers is Blitecast, a late blight forecasting tool developed in the 1970s. Blitecast alerts growers when weather conditions are prime for the pathogen to thrive (think The Weather Channel for late blight). Blitecast allows farmers to pinpoint the optimal time to apply protectants to keep their crops safe. In some years, this tool can eliminate five to eight applications of costly late blight fungicides per field on average, “which saves Wisconsin growers roughly $1.5 million per year,” Gevens says. She adds that this number doesn’t reflect the other indirect savings on things like fuel, manpower, time and reduced environmental impact. More accurate application of the fungicide also aids the prevention and management of the pathogen, which reduces the risk of it causing costly infections on other fields, crops in storage, and seeds. In other years, however, the Blitecast tool may indicate the need for more frequent crop protectants, which are essential for maintaining the health of the crop. Gevens aims to continue building awareness of the many resources her program and department provide, such as the UW-Extension Plant Disease Diagnostics Clinic and the UW Vegetable Pathology website, newsletter and forecasting tool. In most recent years, the clinic has offered free late blight diagnoses to promote detection and awareness of the disease, and anyone — from home gardeners to commercial farmers — is welcome to send in samples for plant disease diagnostics. The Plant Pathology Department has also initiated the Late Blight Share program, which helps growers identify the symptoms of late blight. The program provides free transplants of the tomato cultivar Iron Lady — a late blight-resistant cultivar developed at Cornell University. The program has been successful in Portage and Langlade Counties, and Gevens’ team proposes to expand it to five counties next year. These efforts have contributed to a shift in late blight management in Wisconsin. “We’ve moved from focusing on specific areas in certain regions to a statewide coordinated effort,” Gevens says. She attributes much of this shift to her program’s success in expanding outreach to include commercial and noncommercial production and conventional and organic systems. Further, she has worked to increase the circulation of the UWEX Vegetable Crop Updates newsletter, which details the location of late blight, risk of disease (from Blitecast), pathogen strain types, and management recommendations. She has seen this need translate to the growth of the plant pathology undergraduate program from two to 30 students in the last five years. This explosion was facilitated with the help of campus partners like First-Year Interest Groups, which established a set of courses on food security for first-year students where they were introduced to plant pathology. Students are also connected to the program through a network of advisors. Kenneth Cleveland’s advisors encouraged him to get hands-on experience in a lab. “I had no lab experience whatsoever and wasn’t sure if I was up for it,” Cleveland admits, but an advisor walked him over to Gevens’ office to introduce him. Shortly after he began working in her applied vegetable pathology lab, he made a life-changing decision. “Dr. Gevens helped me get hands-on experience, reviewed my resume, gave me co-authorship on her research papers, sent me to several conferences, encouraged me to apply to scholarships,” Cleveland says. He also mentions his gratitude to the Plant Pathology Department’s advisors, who helped him stay on track for graduation and made sure he was getting the right experience for his career goals. 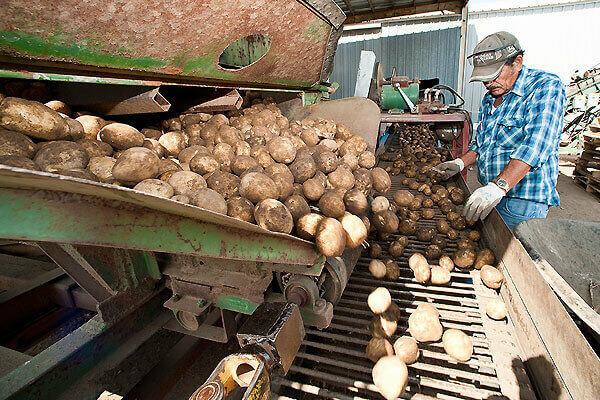 Thanks to the encouragement of Gevens and his advisors, Cleveland applied for and in 2010 won the first annual Syngenta Potato Scholarship, a scholarship for students who are finding innovative growing techniques that help the potato industry move forward. Cleveland’s essay discussed his research project, which focused on controlling another disease of potato, early blight (similarly named, but a different pathogen altogether). Cleveland now works with Syngenta as a retail sales representative, and hopes to continue to work directly with growers and their retailers addressing agricultural issues and educating each on what they can do to protect and enhance their crops.